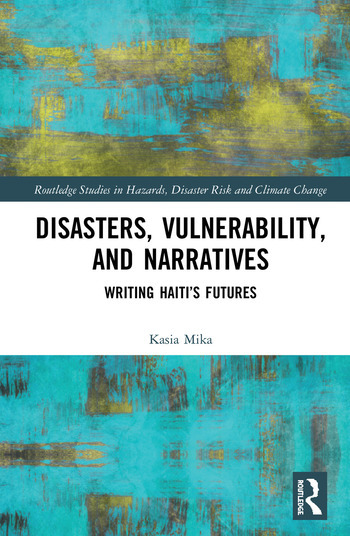 This book uses narrative responses to the 2010 Haiti earthquake as a starting point for an analysis of notions of disaster, vulnerability, reconstruction and recovery. The turn to a wide range of literary works enables a composite comparative analysis, which encompasses the social, political and individual dimensions of the earthquake. This book focuses on a vision of an open-ended future, otherwise than as a threat or fear. Mika turns to concepts of hinged chronologies, slow healing and remnant dwelling. Weaving theory with attentive close-readings, the book offers an open-ended framework for conceptualising post-disaster recovery and healing. These processes happen at different times and must entail the elimination of compound vulnerabilities that created the disaster in the first place. Challenging characterisations of the region as a continuous catastrophe this book works towards a bold vision of Haiti’s and the Caribbean’s futures. The study shows how narratives can extend some of the key concepts within discipline-bound approaches to disasters, while making an important contribution to the interface between disaster studies, postcolonial ecocriticism and Haitian Studies. Kasia Mika is a Postdoctoral Researcher in Comparative Caribbean Studies at the Royal Netherlands Institute of Southeast Asian and Caribbean Studies and teaches at the University of Amsterdam. Her other work is published, among others, in The Journal of Haitian Studies, Moving Worlds: A Journal of Transcultural Writing.